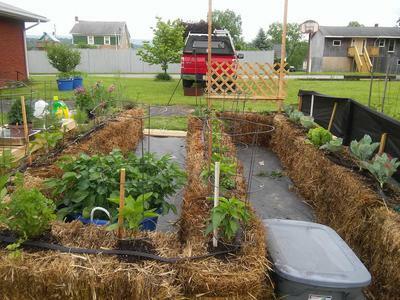 Straw bale gardening is fun and has several great advantages! But, there are to be found many mixed reviews as to the performance of plants grown in this medium. This is my first try at it. I'm learning as I go. With 24 bales set, I'll brace them up in order to get two years of use. Along beside my bale garden, I have several regularly potted vegetables and flowers, too. They are the same seedlings and a few clones. Well, there's no comparison. The plants in the soil containers are healthy, lush, and green. The plants in the straw are stunted and yellowish. Oh, I'v given them all the right amendments, which has helped a little. Finally, I realized that those bales are still composting, and will for some time. This process uses even more nitrogen, competing w/ my veggies. I added nitro-water, then the plants perked up !!! Another thing very essential is to know if the fields were sprayed with herbicides? Some wheat is full of that stuff!!! Try growing veggies in herbicide laden straw and see what happens... Bummer. After posting this page, I returned to my search on how to solve the problem of this currently deficient growing medium. Foliar fertilization! Never heard of it, but I'm excited, because they say it's a life saver. Foliar spraying is a common practice, but especially when crops are suffering, due to soil problems- pH, uptake, nutrient deficiencies. In my case, I will follow a recommended application of 1% Urea water and 1% magnesium sulfate (epsom salt) and spray it on both sides of the leaves... I'll return after 7 days to report. Larry, interesting to read your straw bale efforts. Fingers crossed you get enormously huge veggies from them. Look forward to updates! The 1% urea and 1% epsom spray has worked in only two days. Came back and watered them w/ lime water. Plants are greener than ever, producing flowers and tomatoes, w/ no signs of blossom end rot. Foliar fertilization is key to helping suffering plants!